Since his passing late last week, there have been all kinds of memorials and remembrances for Leonard Nimoy. Friends, fans, the President, and Canadians have all shared their fond memories and important lessons learned from a man who touched many, many lives. Most of us were never fortunate enough to meet him, but that doesn’t mean he didn’t have an impact. During his time on J.J. Abrams’ 2009 Star Trek reboot, he not only reprised his most famous role as Spock, often called Spock Prime, he befriended Zachary Quinto, who plays the new version of the character. The two maintained a close friendship over the subsequent years, and the younger actor crafted a moving tribute to his departed friend. Working with Leonard was one thing, but getting to know him and forging the relationship that we did was an entirely different experience, and one that I never could have anticipated when I took over the role of Spock. Initially, I was coming at it all from a strictly creative standpoint. I wanted to know that I had his support and that I could utilize him as a resource and guide through the journey of discovering who this character is for me. But what I never imagined was how close we would become, and what a father figure he would be to me. I lost my own father when I was very young, so to have this man come into my life and resonate so many qualities to which I aspire, and be such an example of dignity and grace and fulfillment — that was the part of it that so far exceeded any expectations I could have had. And that is the part of me that feels the greatest sense of loss at his death. Leonard had a way of communicating that was never pedantic — he was never trying to teach, and yet he lived with such completeness that there was wisdom in everything he said. Filtered through this relationship that eventually developed, it makes the scene in Star Trek when the two Spocks meet that much more poignant. 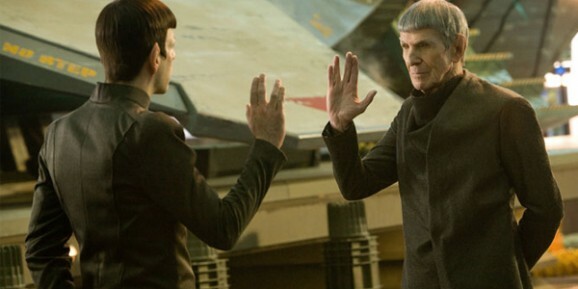 You’ll remember that New Spock sees the back of Spock Prime’s head and shouts, “Father.” Both Quinto and Spock are boys who lost fathers, and in some capacity, Nimoy and his Spock fills that role in both instances. Mr. Quinto sounds like he’s on the path to becoming much beloved, as was Mr. Nimoy. He seems sensitive, articulate, humble, and very grateful. Lovely tribute. This totally didn’t make me cry. Nope. Totally didn’t. Me neither. I just got something in my eye, or allergies, yeah, allergies.